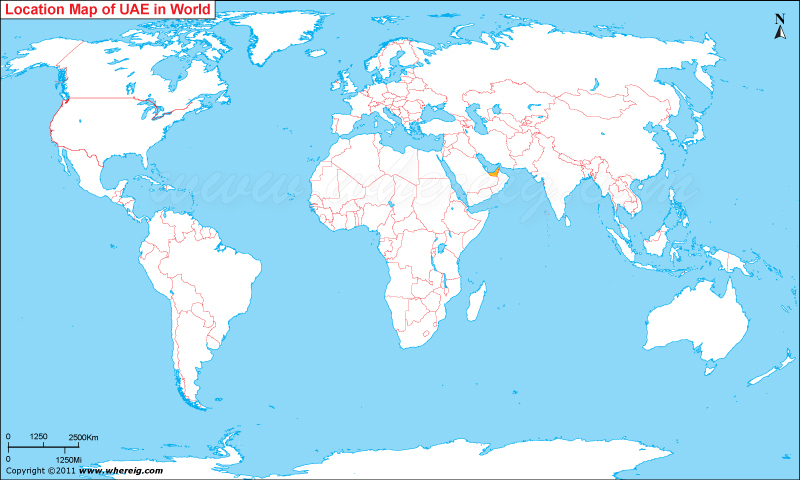 Where is United Arab Emirates located on the world map? The given United Arab Emirates location map shows that United Arab Emirates is located in the south-western part of Asia. The United Arab Emirates map also shows that it situated at the south-east end of Arabian Peninsula. Map of United Arab Emirates illustrates that it shares its international boundaries with Oman in the east, Saudi Arabia in the south and south-west, and Qatar in the west. Besides, the Persian Gulf lies in the north and north-west part. However, the name United Arab Emirates is abbreviated as UAE. The climate type of UAE is arid. The capital city of United Arab Emirates is Abu Dhabi. However, the Dubai is more functional and global city of UAE. The government type of UAE is a federal, presidential, elected monarchy. Furthermore, the UAE is in fact a federation of seven absolute monarchies: i.e. the Emirates of Abu Dhabi, Dubai, Fujairah, Sharjah, Ajman, Ras al-Khaimah, and Umm al-Qaiwain. The head of Abu Dhabi is President of the United Arab Emirates; whereas, the head of Dubai is the Prime Minister of the United Arab Emirates. UAE is a member of the Cooperation Council for the Arab States of the Gulf, and also a member state of the Arab League. Besides, it is also a member of the United Nations, the OPEC, the Organization of the Islamic Conference, and the World Trade Organization. The economy of the country is largely depends upon the oil reserves. It is sixth largest oil reserves country of the world.